We’ve been helping our clients build customer advocate databases for over a decade. 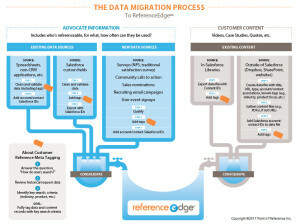 Recently we created a visual (infographic) to help explain the steps involved in corralling and tagging 1) information such as referenceability and attributes such as industry, geography, use case, etc. ; and 2) customer content such as case studies, videos, press releases, etc. This infographic was designed with the assumption that the CRM system is Salesforce, but the process, including CRM IDs, is the same. Every company should have a complete, accurate view into its best customers and know how they can be leveraged in sales and marketing activities. With our compliments, we hope this tool helps put in perspective what’s necessary to get that golden database put together. What should be included in my customer advocate database? You should have both accounts and contacts. The accounts’s industry, geography and other consistent attributes that users search on should be included. Contact information will differ if there are multiple references within your accounts. Each may be familiar with a different part of your solution, use case, and will certainly have preferences related to reference activities. Some may enjoy public speaking, while some hate it. It’s important to note how often each contact can be used in a time period (monthly, quarterly, etc.). All content associated with your advocate accounts should be in one place so that users can search for the most relevant content to their opportunities or marketing projects. Just like advocate contacts, content should be tagged for the part of your solution described, the related account’s industry, size, etc. And most content is naturally more appropriate in different parts of the sales cycle, so it should be tagged accordingly. Evaluate the data that you have. Determine whether its still current and accurate. Work with the people closest to your advocate accounts to update the information as needed. If advocate information or content is outside of your CRM system you should take the time to tag accounts and contacts with the related CRM IDs. This has benefits down the road should you need to connect the data between the sources. If you plan to import information into your CRM system it is essential. Who should own customer advocate data? We believe this is a team sport. Marketing, which typically owns the database, is not always in the know when it comes to the current status of an account or contact. That is the account owner who may have won the business, or may be on the post-sales team maintaining the account (customer success, account management). These are the people who should have as part of their job the responsibility of periodically reviewing and updating advocate information. Customer content is squarely a marketing function. This team should not only be generating new content, but periodically reviewing older content to ensure it’s still accurate, uses current terminology and that the customer contacts cited in the video or case study, for instance, are still with the advocate account and happy. This is the million dollar question. First, the more focus this project has the greatly the likelihood of success. It is detail oriented so frequent multitasking while working with data will not be helpful. Little mistakes with data often have a ripple effect of greater proportions. Give someone the lead role and secure leadership support to ensure the leader gets the cooperation and responsiveness needed. When everyone is on the same page the end goal will be reached faster. © Copyright 2019 - Point of Reference, Inc.